One of the great reasons to do business with The LawnMower Medic® is your ability to participate in our optional service agreement plan. With this plan, we will perform all scheduled services / preventative maintenance, we will cover the labor on all breakdowns, we will guarantee a 72 hour response time for breakdowns (even during the peak season), and we will provide a battery charger, as well as enough fuel stabilizer for 3 years. Simple, easy, and let’s you rest assured your investment in your lawn equipment will be assured for years to come. In order to plan, organize, and prepare the service contract, customers will start the first cycle of services in the month you are assigned in the year applicable to your purchase based on our scheduling and availability. 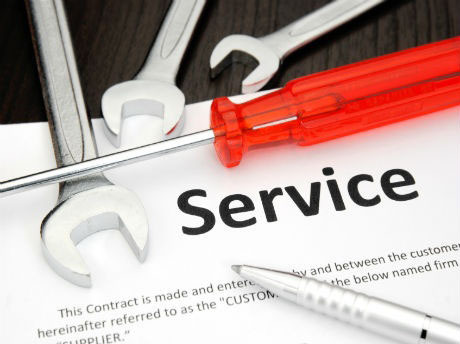 We offer the Supplemental Service Agreement to cover you for unexpected breakdowns from your inspection service until your contract is activated on the first maintenance service, which begins the 3 year cycle. Please note that while The LawnMower Medic® covers a wide range of areas in NC and Virginia, this pilot program for our service agreements only covers the following areas in North Carolina: Davidson County, Forsyth County, Guilford County, Stokes County, Surry County, and Yadkin County. If you live outside of these areas and are interested in the program, please click the contact link at the top of the page and let us know. Please note that our service agreement does not cover warranty repairs. Warranty repairs should be handled by a certified dealer for the brand of mower you own. If you have further questions about our service agreement, please contact us via the contact link at the top of the page. All labor covered for 3 years! All preventative maintenance covered for 3 years! Super fast response time for break downs! All labor for any unexpected breakdowns for 3 years. 72 Hour Response Time for Breakdowns. The service agreement begins on the first anniversary date of your first service, which begins the 3 year term. We also have an optional addendum for this contract to cover you for the period between contract signing and your first annual service. The LawnMower Medic® is not responsible for neglect &/or abuse to your equipment. The LawnMower Medic® is not an authorized warranty dealer for any manufacturer. Any breach of the terms of the agreement by the customer cancels the agreement in its entirety. No refunds are offered for the service agreement. Our response time for breakdowns will be 72 hours. However, our ability to make repairs are contingent upon not having inclement weather. Schedule an appointment for Inspection using the Inspection Coupon that corresponds to your machine for inspection to qualify for contract approval and acceptance! If your mower has been repaired or serviced by the Lawnmower Medic this year the inspection is not required but the machine must not be broken or damaged since the last service or repair! If you have read and agreed to the information above, you may click the button below to purchase the service agreement purchase page.